Thanks to all who joined us October 26th for the 3rd Annual Trivia Night & Silent Auction. We had 25 tables and 200 players. In total, the event raised approximately $12,000. All proceeds will be donated to the Missouri Patriot Paws. This organization provides military veterans and first responders suffering from Post-Traumatic Stress Disorder (PTSD) or Traumatic Brain Injury (TBI) with a trained service dog, and most dogs trained are rescued from local shelters. The big winner of the night, for the second consecutive year, was Second Sight Systems, with KAI taking second place and Oates Associates taking third place. 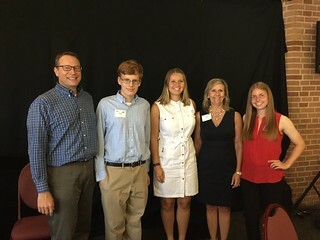 Congratulations to our winners, and we hope you all can join us next year! 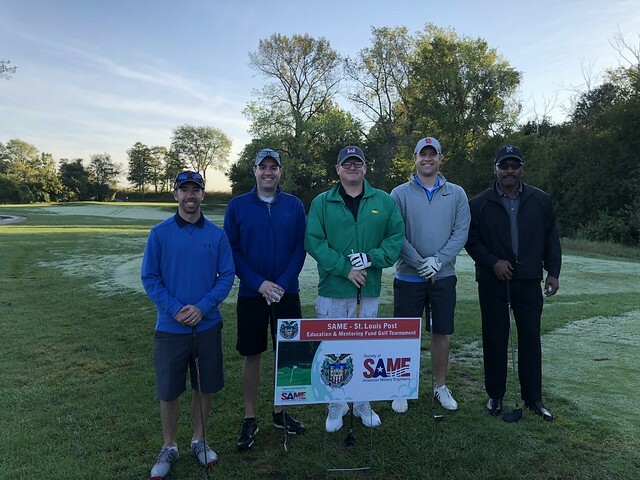 On September 281, 2018 the SAME St. Louis Post hosted the 19th Annual Education and Mentoring Fund Golf Tournament at Gateway National Golf Links. The event was organized by Bob Welsch. Major sponsors of the event included Stantec, HGL, and Stanley Consultants. A big thank you to all our sponsors and all of our participants! Back in April, the SAME St. Louis Post had the great opportunity to meet with Col. Nick Desport, RA, F.SAME, USAF (Ret. 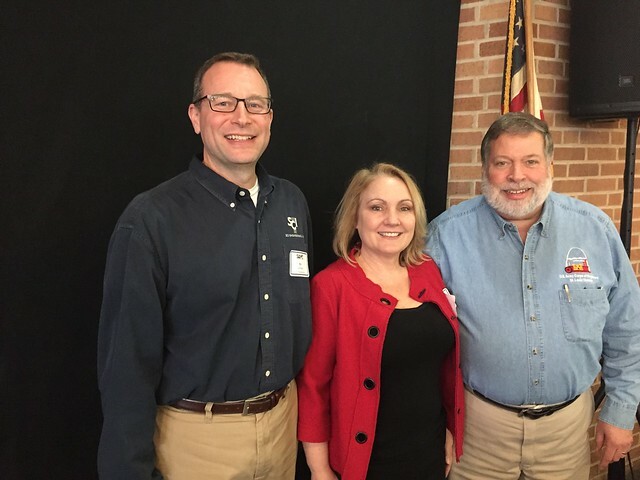 ), SAME National's Program, Membership and Post Operations Director and Ms. Jackie Hacker, F.SAME, Regional Vice President for the SAME Missouri River Region. Col. Desport and Ms. Hacker were given a tour of The Engineering Center of St. Louis. The SAME St. Louis Post contributed to the Vision2015 Capital Campaign which funded the recent renovations to The Engineering Center and was presented with a plaque by Ms. Joy David from The Engineering Center in appreciation of contributions made by the St. Louis Post. Mr. Adam Christy, P.E., U.S. Army Corps of Engineers presented on the evolving Corps of Engineers Levee Safety Program. Adam is the Acting Levee Safety Program Manager for the USACE St. Louis District. 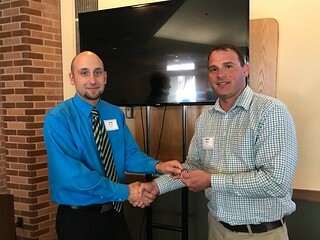 His work includes collaborating with various disciplines of USACE, levee sponsors, and other agencies to reduce the risks associated with living and working behind a levee. Adam holds a Bachelor’s Degree in Civil Engineering from the University of Southern Illinois Carbondale. He previously worked in the private sector where he gained experience in a wide array of civil/geotechnical engineering projects, including levee inspections. The mission of the Corps Levee Safety Program is to ensure levee systems provide benefit to the nation by working with sponsors and stakeholders to assess, communicate, and manage the risks to people, property, and the environment from inundation associated with the presence of flood risk management systems. A relatively new development is Levee Inventory & Review. This project consists of working with state and local tribes to identify non-USACE portfolio levee systems and provide the owner with a one-time inspections, risk screening, and best practices for maintaining their flood risk reduction asset. 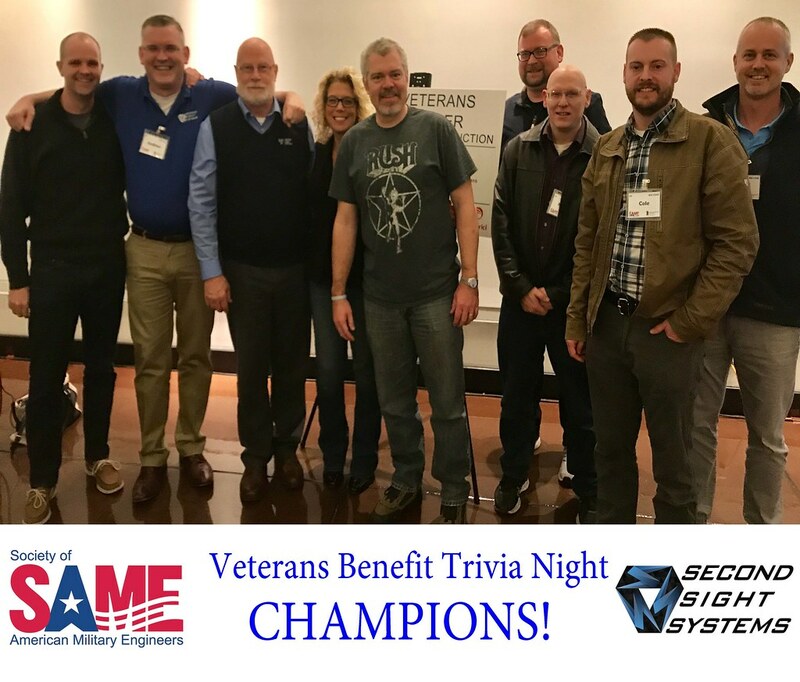 In November, the SAME St. Louis and Scott Air Force Posts hosted the Second Annual Trivia Night at the Missouri Botanical Garden. Congratulations to the Second Sight Systems team, who took top honors this year. Thanks to all who participated and/or donated to the Gateway Chapter, Paralyzed Veterans of America. The total raised was approximately $10,000! Ms Mandy Yeomans, US Army Corps of Engineers, St. Louis District as the AE Coordinator and Architect presented on projects she completed in the Middle East. 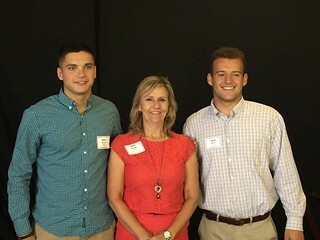 Once again, post members participated in the Annual "Summer" social event at the Anheuser-Busch Beirgarten. Ms Patricia B. Voss is the District Contracting Chief, Mississippi River Valley, St Louis. Ms Voss has had multiple assignments as a Contracting Officer and Procurement Analyst including the Missile Defense Agency, Federal Emergency Management Agency, and the Pentagon Renovation Program. She has served on the Senior Contracting Staff for two Air Force Major Commands (Air Mobility Command and United States Air Forces in Europe), and the Assistant Secretary of the Air Force for Acquisition. John Seiler, Executive Vice President- Seiler Geospatial Division, Seiler Instrument & Mfg. 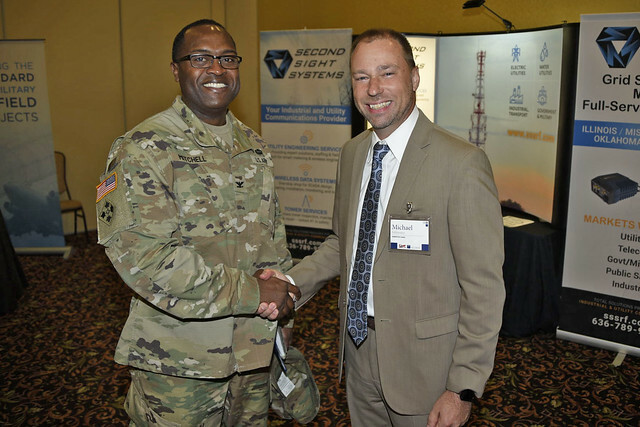 Co. Inc., discussed Geospatial Technology Solutions, Challenges and Opportunities for Government & Industry. Mary Kate Brown from the the Madison County Emergency Management Agency discussed the use of the Code Red Mass Notification System as a tool to assist with warning residents when the County is facing a disaster that requires a mass evacuation of its citizens. 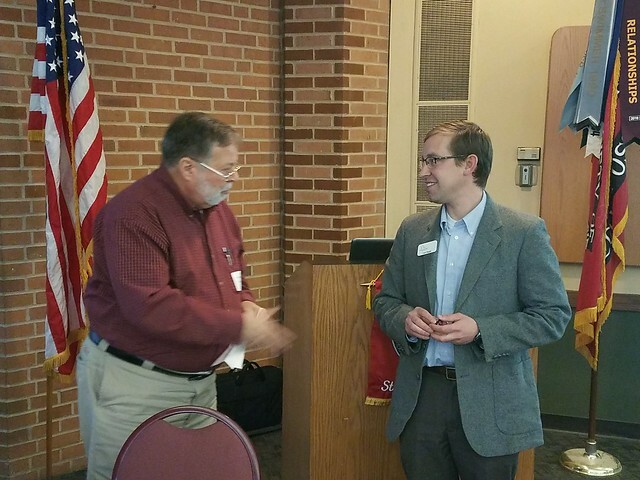 Christopher J. Redell from the Geotechnical Branch in the St. Louis District - Corps of Engineers presented on the Wood River Drainage and Levee District (WRD&LD). 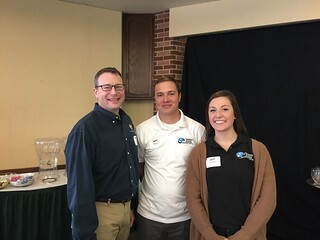 The 5th Annual Industry day was a great success! Thanks to all who attended this year’s Industry Day…and a special thank you to all of our speakers, roundtables hosts, and sponsors! Check out the Industry Day page for topics that were presented. Stephanie Hall, PMP, USACE, presented on the new NGA Campus West facility that is estimated at nearly billion dollars. The project will accommodate new technologies and processes that will generate beneficial synergies through integration, collaboration, and geospatial data immersion. The ‘purpose-built’ facility will provide an open flexible work environment that is scalable, reconfigurable, and adaptive to changing mission requirements and the associated changes in workflow and data sharing methodologies. The project will provide NGA’s workforce with safe, secure, and efficient facilities that will meet the agency’s long-term requirements and vision for Geospatial-Intelligence (GEOINT) and will be consistent with the Director National Intelligence (DNI) facilities strategic plan. Stephanie Hall is a Program Manager for USACE Mega-project N2W. The N2W Program was assigned to the Kansas City District for execution of design and construction of the new NGA Campus West. Stephanie is responsible for the team that will provide planning, design, procurement and construction oversight and contract management of this facility. 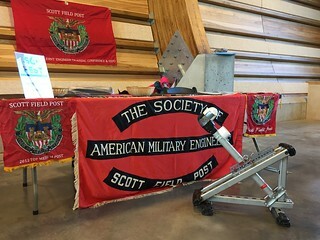 During Engineers' Week, the SAME STL and Scott AFB Posts sponsored the catapult exhibit at the Dream Big SciFest event at the St. Louis Science Center. Kids (and adults!) were able to operate the catapult and learn how the science behind the catapult is used for other applications. 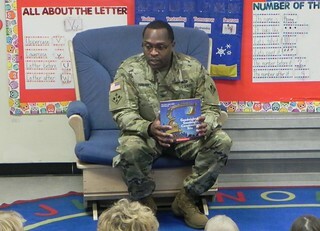 On February 14, COL. Mitchell, Past President and Director, read "Goodnight, Goodnight, Construction Site" to the preschoolers in the Rainbow Castle Childcare Center. Books were donated to the children by the SAME St. Louis Post. Adam Christy also assisted with delivering the books to the preschoolers. The Engineers Without Borders chapter at Missouri University of Science & Technology (EWB-S&T) presented the team's current potable water projects located in Honduras, Bolivia, and Guatemala. The presenters, Matthew Baer and Josephine Gass, have been involved with this project since the start of their time at Missouri S&T.